There was a meeting of Cairo judges today at their syndicate in Downtown Cairo in which they were set to set out their positions on the judicial supervision of the parliamentary and presidential elections coming this fall. At this point, the meeting is still taking place and there are rumors that the government is trying to offer them a deal to take a less, er, principled stance than their colleagues in Alexandria did a few weeks ago. We'll know later tonight or tomorrow, as media presence was tightly controlled and Al Jazeera was thrown out (some say arrested) after they tried to broadcast the meeting live. I went over there to see all this, but instead I was treated to rather burlesque spectacle: a large pro-Mubarak demo organized by the ruling National Democratic Party. I think there were at least 500 people there -- possibly more -- all men and many of them young. They seemed to come from certain specific neighborhoods, and from what I gathered talking to them they were part of NDP youth associations and workers associations in places like 15th May City outside of Cairo as well as Cairo neighborhoods such as Daher, Ghamra and Ezbekiya, essentially middle class and lower middle class neighborhoods just on the outskirts of Downtown. It was one of the most well-organized demo I've seen in Egypt, in that they had brought tablas and there was a good beat for them to sing along to when chanting their eternal devotion to Hosni. Take a look at this video I made (direct download link)to get a sense of the event. We welcome participation and competition by all 18 parties of Egypt without reserve or condition as directed by the president of the republic and leader of the party. This was obviously intended to back the recent amendment to article 76 of the constitution that has the opposition outraged -- many were expecting something much more open than the text that was finally adopted, which Josh described a few days ago. Other signs were about how the different neighborhoods pledge their loyalty to Mubarak, and similar drivel. The chants changed from the usual paeans to Mubarak to the occasional barb against America and its traitorous agents in the motherland. "America, we don't want your money" they said without a hint of irony. The low-level NDP members I spoke to there -- typically the secretaries of the local branch of the party in their neighborhood -- were predictably effusive about their leader. Their main refrain was that Mubarak was a man of experience, a great diplomat and a man of peace, and the most revolutionary and pro-democracy Arab leader since he had backed the amendment of article 76. "We the first Arab country to have such a democratic move," one man told me. "Mubarak is a wise man." They also said that Mubarak had protected them from war and the Israelis, and would also protect them from the Americans, who the man assured me wanted to invade Egypt as they had Iraq. Another important theme was stability and security. 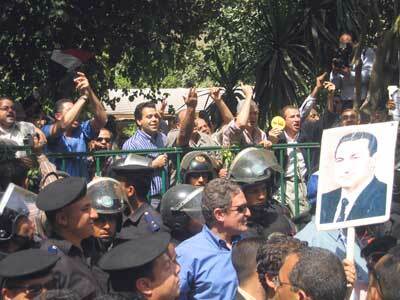 Mubarak had fought terrorism and won, and another man told me terrorism now no longer existed in Egypt. I looked at him rather incredulously and asked him, "what about last week's bombing?" He said, "No, that was a lone madman, not a real terrorist. Just a crazy guy. There's crazy people everywhere, don't you have crazy people where you come from?" OK. Then I asked about the economy, how unemployment had gone up, times were tough and many people seemed to blame Mubarak for this. I got the usual speech about how Mubarak had modernized the country, launched great projects, and then once again: "Unemployment is a universal problem! Tell me which country doesn't have unemployment? You have unemployment where you come from, don't you?" I could see where this was going, so I switched topic. I asked them for their opinion on the demonstrations staged by the Muslim Brothers and Kefaya. "We're not afraid of them," one man said, but we don't like their extremism. As for Kefaya, their were dismissive, saying they did not represent the Egyptian people. Then I asked about Ayman Nour, which got them excited. "Ayman Nour is just after money," they assured me, "he is a corrupt man." Another chimed in, "Who is this Ayman Nour anyway? He's a nobody. How can we compare him to a man of history like Hosni Mubarak? And who is this Ibn Khaldoun character too [a reference to Saad Eddin Ibrahim, who runs the Ibn Khaldoun Center] -- we don't want these American agents." After that, things got really interesting. I walked down the street to where the Lawyers' Syndicate is, and saw there was a much smaller Kefaya demo locked inside the Syndicate's garden, fenced off from the NDP demo. At the beginning, the Kefaya people were just standing quietly watching the other demo with some amusement (or maybe it's that incredible permanent boyish smile on uber-activist Kamal Khalil's face). But then, I witnessed the funniest thing I'd seen in a long while: the two groups started chanting against each other in a kind of group rap battle. Most of it was fairly good-humored, although some people -- usually more senior NDP and security types who seemed to be coordinating the NDP demo from outside the barricades -- were rather angry. One man yelled out to the Kefaya people that they were "criminals and terrorists." The funniest moment was when the the Kefaya people took out 20 pound bills and waved them across to the NDP crowd, shouting, "Take my 20 pounds" -- a reference to the belief (and for many probable fact) that the NDP buses over these people to demos with a mixture of intimidation and incentive, notably by promising them 20 pounds if they come. The highlight however -- a real moment of epiphany -- was when the two sides started pointing and chanting the same thing at each other: "They are with America! They are with America! They are with America!"